1.1 What is the DL1 SPORT? 1.2 Who is the DL1 SPORT designed for? 1.3 What does the DL1 SPORT do? 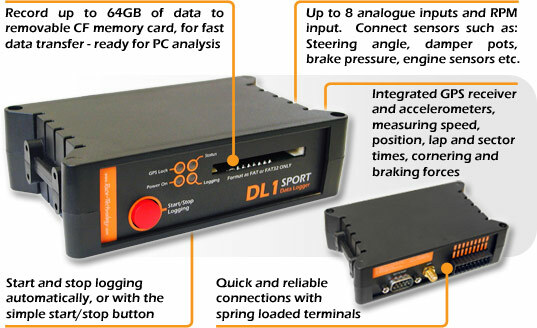 The DL1 SPORT is a state of the art, highly robust, compact "black box" data logging system. Put in the simplest terms, it stores a wide range of vehicle data for later analysis on a computer - the system does not include an in-vehicle display, Race Technology has a number of dashboard solutions available for the DL1 SPORT. The DL1 SPORT was initially designed for autosport applications including drag racers, single seater racing cars, rally cars or road cars - however it is also ideal for use on power boats, go karts and motorbikes. It is also an ideal platform for use in the auto industry for car testing of all types, from long term monitoring to competitor benchmarking. The DL1 SPORT can store data from a number of sources including its built in high accuracy GPS and accelerometers, engine speeds, temperatures, pressures, lap times, sector times etc. The DL1 SPORT comes packaged with the excellent Race Technology data analysis package for Windows. The software allows super accurate track mapping, user defined channels, powerful graphing and allows direct comparison of up to 10 data sets (races) simultaneously with almost unlimited laps. One of the key features of the DL1 SPORT is its built in high accuracy GPS system - this gives the DL1 SPORT advantages over other data loggers in 2 key areas - greatly improved track maps and far more accurate speed data. Built in GPS. The GPS unit inside the DL1 SPORT measures the speed and position at a rate of 5Hz, for fast tracking applications such as vehicle testing it is one of the best available for under $1000. The measurements from the GPS and accelerometers are combined to calculate very high accuracy positions and speeds at 100 times a second. Built in accelerometers. Built in 3-axis accelerometer with 2g full scale (optional 6g full scale). Logging to compact flash memory. Compact flash memory is robust, economical and ideal for use in data logging products. The advantages of using compact flash memory include incredibly fast download times (using a suitable card reader) and huge storage capacities (tested with cards up to 64GB). 8 analogue inputs. The DL1 SPORT has 8 high accuracy analogue inputs. All the inputs are 12-bit accuracy (4096 different levels) and have an input voltage range suitable for use in 12v vehicles. 2 RPM inputs. The DL1 SPORT has 2 RPM inputs, only one of which can be used at any one time. One input is designed to be connected to "high level" sources, such as the ignition coil. The other input is designed for low level signals such as a feed from the ECU. Serial data (RS232) input. The serial port can be configured to accept data from an external source - possible examples are data from the engine management unit, OBDii or CAN data (with a suitable adapter). Serial data (RS232) output. As well as logging the data to compact flash it is also available from the serial port. This data can be sent to a suitable dashboard such as the DASH2 / 3 / 4PRO . Lap trigger input. Used to add lap marker when logging data. Small and tough. At just 120mm x 80mm x 35mm (4.8" x 3.25" x 1.5") it can be fitted into the smallest single seater, motorbike or go kart. The DL1 SPORT is housed in an injection moulded plastic enclosure. Simple operation. A single button to start or stop logging, it's as simple as that! If the button is inaccessible from the drivers seat then a remote button can be added. Power supply requirements. The power supply to the DL1 SPORT data logger can be taken directly from the vehicles 12v supply, or it can be powered from it's own battery if required. The power supply is smoothed and regulated within the DL1 SPORT ensuring its performance is highly robust and stable. Testing. Very high reliability is ensured by calibrating, temperature testing and vibration testing each unit on an individual basis. Autosport applications make tremendous demands on electronic systems and we take great care to make sure our products are up to the task. All the connections to the units are vibration proof, high strength, lever terminals to ensure that connections do not fail at the critical time. Powerful. The 2 processors in the DL1 SPORT are the very latest generation RISC processor that features both higher speed operation and flash upgradability - so as we add new features to the DL1 SPORT you can upgrade yours to the latest specification.